Laser Skin Tightening in Mississauga, Toronto, Etobicoke and Surrounding Areas. Trillium Laser is now offering skin tightening with our brand new state-of-the-art Intracel and Powershape/Magic Pot Lasers. INTRAcel is a treatment using Fractional RF Microneedles. It gives fractional damage to the deep dermis. It means damaged tissues are surrounded with undamaged normal tissues. There was a limitation to use high energy due to concern of epidermal burn. Many devices in the current market can’t give the energy to the dermis without passing the epidermis. But, INTRAcel uses micro needles as the passage of energy transmission to give selective heating to the dermis directly targeting different depths of the skin. The INTRAcel Laser Rejuvenation system aids in replenishing skin cells and terminating any damaged or excess skin cells that may be clogging pores or leaving unwanted deposits on the skins surface. POWERShape/Magic Pot is a breakthrough integrated cellulite and body shaping system synergistically utilizing Bipolar RF (Radio Frequency), Low level laser and Vacuum roller to increase metabolism in localized fat area. Incorporating 3 applicators of different sizes, PowerShape comfortably achieves a toned, contoured and well shaped body through a safe, non-surgical painless treatment. RF promotes the metabolic process in local fat area by heating the adipose tissue to a depth of 5-10mm and effectively treats cellulite. Vacuum increases blood circulation and evens out the skin to optimize efficient energy delivery. Massaging effect facilitates lymphatic drainage and reshapes the body smoother. Low level laser emits specific wavelength of light (650nm) which liquefies the fat to remove the fat easier and significantly reduces the size of fat cells. PowerLifting represents Magicpot’s specialized facial lifting system by using Radiofrequency, Vacuum and LED technologies. The both of facial and alternative handpiece can be applied to target regions as facial and neck, it brings dramatic treatment results. 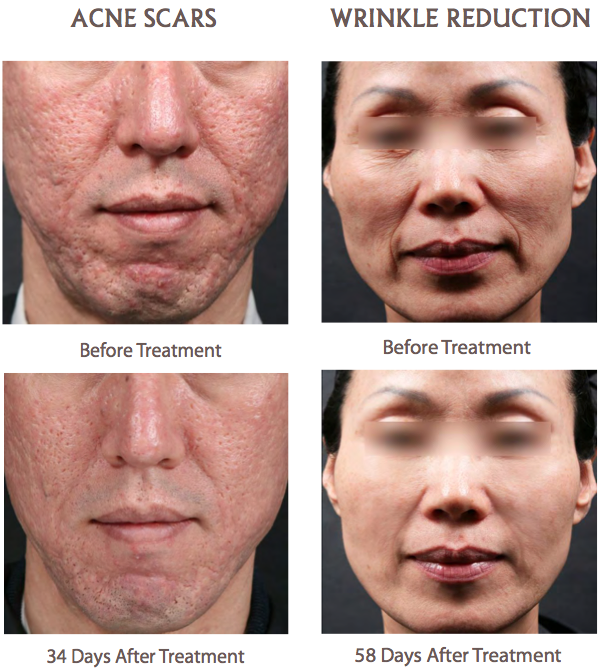 Our Nd:YAG laser has the ability to perform amazing photo-facial skin tightening treatments that have out-performed Thermage in every aspect during clinical testing. This laser treatment creates a remodeling of collagen beneath the dermis, similar to the principal of the Cellulite treatments. Skin Tightening results begin 30 days after your 2nd treatment. Maintenance treatments are required every six months or so. We suggest that a topical anesthetic is used prior to treatment as it tends to be a somewhat uncomfortable process. Topical anesthetics such as Xylocaine numbing cream is available at our clinic. The YAG laser used for Skin Tightening also has a dynamic cooling feature which delivers consistent epidermal cooling that helps with patient comfort during procedure. 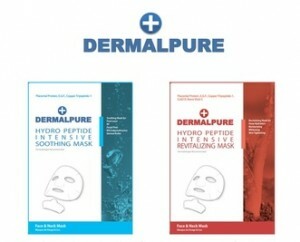 Dermalpure’s Hydro Peptide Facial Mask Series contains an Intensive Soothing and an Intensive Revitalizing Mask. Their serum was formulated with top quality ingredients to repair damaged collagen also hydrate and moisturize the skin. This will improve the firmness and elasticity of the skin. Dermalpure’s Hydro Peptide Intensive Soothing Mask is good for cooling and moisturizing your skin post-Laser, RF, Facial Peel, Microdermabrasion and Dermal Roller treatment. Dermalpure’s Hydro Peptide Intensive Revitalizing Mask is formulated with stabilized Nano Vitamin C in the form of liposome which optimizes penetration in the skin as its structure is similar to our skin cells. It hydrates the skin and makes it look visibly brighter. With regular use of either one of Dermalpure’s masks your skins collagen damage from the sun and aging will be repaired. It also provides deep hydration giving you the appearance of younger, firmer and fuller skin. Is good for cooling and moisturizing your skin post-Laser, RF, Facial Peel, Microdermabrasion and microneedling treatment. Is formulated with stabilized Nano Vitamin C in the form of liposome which optimizes penetration in the skin as its structure is similar to our skin cells. It hydrates the skin and makes it look visibly brighter. Copper Tri-Peptide: Promotes Collagen Regeneration. which Reduces Wrinkles and causes Skin Tightening. It has been used as a wound-healing agent since the 1970s. Its effect is to remodel the skin by clearing away damaged cells, rebuilding the skin’s circulatory system, activating the skin’s primary antioxidant protein and stimulating the production of new collagen. As irregular skin normalizes, wrinkles decrease and skin tone is clarified. It has many medical uses and more are being discovered almost daily. It is helpful for wound and burn healing and has achieved amazing cures of severe ulcerating skin diseases. There is no doubt that topical EGF stimulates new skin growth. Coenzyme Q10: Possesses antioxidant properties and have been suggested for slowing down the aging process and protecting the skin against oxidative damage by free radicals. Creams and serums containing CoQ10 are believed to prevent skin wrinkles and reverse photo-damage caused by UV ray exposure. Placental Protein: Rich in nutrients, amino acids and growth factor, Placental Protein is beyond just skin-whitening. It stimulates skin cell renewal to revitalize the skin. It also visibly reduces and fights the unsightly signs of skin aging such as wrinkles and fine lines. Dermalpure uses lab engineered, synthetic proteins. Vitamin C Derivative: It promotes rapid healing of wounds and damage made by diseases associated with old age. The lone nutrient that prompts our bodies to produce and synthesize collagen is Vitamin C.